Bruges, Belgium, mid 15th century. Formerly in 19th-century green velvet; rebound in vellum over boards with green doublures and tie, green flyleaves, in green box labeled: Speculum humanae Salvationis - German - XV cent. M.385. Edward Davenport of Capesthorne, Chelford, Cheshire, ca. 1860 (ex-libris on inside front cover); W. Bromley-Davenport sale (London, Sotheby's, May 10, 1907, lot 334) to Quaritch; purchased by J. Pierpont Morgan (1837-1913) from Léon Gruel in 1909; J.P. Morgan (1867-1943). Ms. written and illuminated in Bruges, Belgium, mid 15th century. 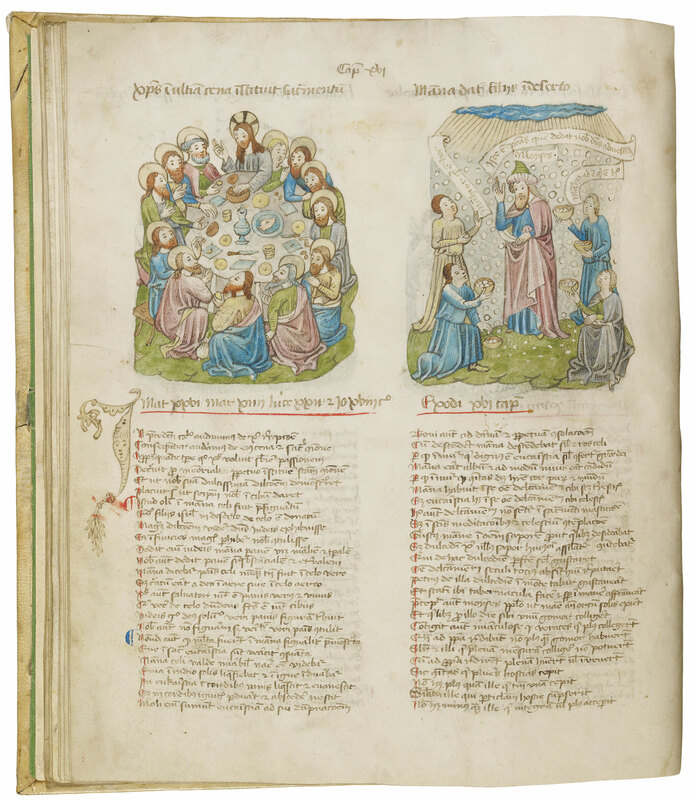 Decoration: 192 miniatures, neat drawings colored in blue, rose, green and grey wash.
Pierpont Morgan Library MS M.385 is in the Pen and Ink Group, manuscripts, including Pierpont Morgan Library MS M.649, illustrated with pen drawings executed by the Gold Scrolls Group.